Now that you can no longer use the cold weather as an excuse to be anti-social, why not invite some friends over and make them a fancy appetizer that highlights some local seasonal flavors? Butter a loaf pan, cut a piece of parchment to line the bottom and butter that as well. Place the stock in pot and bring to a rapid boil. Reduce to roughly ½ cup and set aside to cool. Now, either bring out your food processor or get ready for a lot of mincing. Depending on your skills, you can either roughly chop your ingredients and throw them in the processor, or use your trusty kitchen knife to finely chop. Toast the walnuts in the oven for about five to seven minutes and set aside. Mince the shallots and the garlic and sauté them in two tablespoons of butter, until the shallots are translucent. Start cutting up the mushrooms. (This is where the food processor really comes in handy.) Once the shallots and garlic are done, set them aside in a bowl. Using the same pan, sauté all the mushrooms in the remaining butter, working in batches if necessary. In a large bowl, combine the reduced stock, the cooked mushrooms and your shallot mixture. Next, finely grind the walnuts in the food processor. Add the cream and eggs and combine till smooth, then pour it into your mushroom mixture (make sure the mixture is at room temperature or the eggs will cook). Add the bread crumbs, thyme and the juice of one lemon. Stir all your ingredients together, adding salt and pepper to taste. Pour the mixture into your loaf pan. Set that loaf pan in a larger pan and add hot or boiling water halfway up the side. Bake for one hour. While it’s baking, cut up the baguette into thin slices, arrange on a baking sheet and baste with olive oil. Put your baguette slices in the oven, till they are golden and crispy. 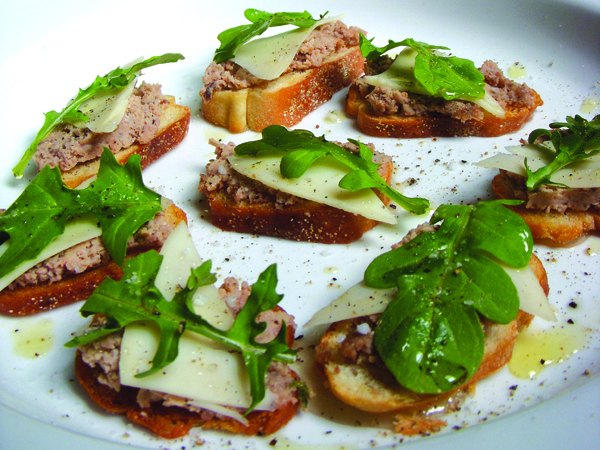 Spread a layer of the mushroom pâté on your toasted bread. Add a thin slice of the toma primavera (I use a vegetable peeler to get a really thin slice) and top with a piece or two of the seasoned arugula.